Very well acted, superbly written. I didn't really know anything about Jobs before I watched, so I can't say how accurate this film is. I did hear that Jobs had a reputation of being an insensitive jerk, and he is depicted that way here, but also brilliant and not always unjust. Very few of the characters come off looking good here. In particular, the mother of Jobs's child is depicted as a parasitic airhead who got to coast through life on Jobs's success. Overall, an absorbing drama about complex, interesting (but not always likable) human beings. Boring! Why are there so many movies about this guy? He made electronics, why is that movie material? Enough already! Im sorry, but the movie kinda sucked. I don't feel like walking out of many movies, but I came close to doing that during this movie, except my girlfriend has a purse like a hockey bag and I didn't want to distract anyone. This movie had poor acting, writing, casting and directing. I see many movies, and I was really disappointed in this movie. It just didn't go together well, maybe another director would have done a better job. Save it for the cheap theatre at best, or wait till it comes out on cable. I can only do one start and that is generous. Acting was really good, pity that they skipped over of detail. Is there some reason why there needs to be a new steve jobs movie every three months for all eternity? Insipid movie... no real story and rather boring. Too bad.. It could have been inspiring. But failed. Decent movie, great acting. Slow in parts but a very worthwhile movie. Move along folks,nothing to see here..! Beware - Negative reviews are written by same person! This is a great movie and superbly acted by Kate and Michael. The story and person are iconic to today's lifestyles. Suspected Jobs was a freak, and this proves it, but most inventors can be twisted. Interesting reviews all hate Apple it seems. Well I thought it was very well acted, I loved Kate Winslet in particular. I think part of the intention was to solidify dislike of Steve Jobs which one would be hard pressed not to by the end of this portrayal. Great Job. 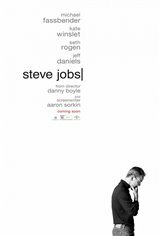 Nothing in the movie really portrays who Steve Jobs was. Gibney tried to invent the wheel by recycling old information and put in a different context. His resources are false and biased, his arguments are mediocre and not well supported, and there are chronological mistakes as well. Yet, he portrays people as bunch of idiots for liking Steve Jobs who in reality is an evil person purposely trying to enslave everyone in his magical "Apple Eco-system." I find it immoral Gibney including an interview of Steve Jobs who already was deathly ill at the time and on pain killers in order to portray him as a villain. Why do so many care so deeply about someone they've never met that they could be moved to tears at a drop of a candlelight vigil? This becomes the entry point to a documentary that seems to neither really attempt to answer the question nor offer any new insight into Steve Jobs. Another movie on this guy. Why? We all know his story. Apple's just trying to shove it down our throats. I'm not giving them a red cent. Their products already have insane mark-ups. Which Apple loyalists don't see as a bad thing. While other companies offer you more bang for your buck Apple gives you inferior hardware (Iphone market). And customers are basically encouraging this money making tactic each time they buy a phone. It's not right! Apple must be driving this 2nd reincarnation. The question is, does anyone care? I know I don't! What more can be told in this movie that hasn't already been told. A complete waste of time and money as far as I'm concern. Why are they making a second movie on Jobs?